Baking is not my forte, but when L. invited me over to partake in a little bun baking lesson with her visiting mother I couldn't resist. First of all, they would be the Mennonite zweiback I grew up with - chewy white buns slathered in butter and destined to be dunked in some sort of hearty borscht. The recipe itself isn't all that difficult. But it's the experience that's invaluable - knowing how much flour to mix in, proper punching techniques (L.'s mom uses a bit of a twist) and timing. First, four cups of warm water gets poured into the bowl (or storage container, as it were) with half a cup of white sugar. Stir, then sprinkle two tablespoons of yeast on top. 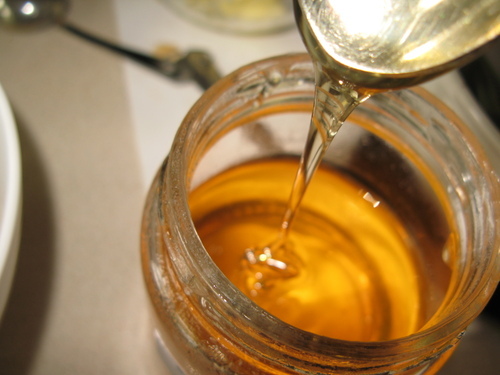 Let it sit until the yeast has thickened (at least 10 minutes), then mix in a cup of oil. The oil is, L.'s mom says, what distinguishes the buns from bread. In a bowl, lightly beat three eggs with a fork and then mix in a cup of warm water. Add to the big bowl. Toss in 3/4 tablespoon of salt. Add about six cups of flour, mixing with a wooden spoon between every couple of cups you add. Then add flour as needed, but punch it in instead of using a spoon. We ended up adding another six cups. Flip a few times, but sparingly. See L.'s fierce punching technique below. She takes boxing classes. It shows. It's hard to explain when you've added enough flour other than actually feeling it for yourself. The only thing I can think of to describe is suddenly my hand wasn't coated in a thin layer of hard-to-remove dough. Instead, it was only sticky enough to cause patches of clinging dough. That's not really helpful though, is it? Let's just go with the six extra cups then. When it's done, smear a dab of butter all over its surface. Now the waiting game begins. An hour or two. I can't even remember. You have to wait until the dough doubles in size. Punch it down. Then the wait starts all over again. Same height. About double the original size. Once it's ready, pull the dough in a thick string and use a knife to cut off bun-sized pieces, keeping in mind they still have to rise a little bit more. Then use your hand to roll each one into a pretty little ball. Using a bit of pressure, push down with your right hand while you roll it around on the table in a circular motion. L.'s mom used her famous double-handed technique of rolling two buns at once. I'd advise you start with one. You should also have a little bowl of oil sitting on the table. This is so you can dip the bottom of the bun in it before placing it on the cookie sheet or whatever flat surface it will be put on while it rises. The neverending bun trays. Each one lovingly rolled and oiled and placed in neat little rows. Cover your perfect little buns in tea towels, then on top of that lay plastic garbage bags to keep them extra moist and warm and happy. Wait some more. Maybe an hour? I'm not sure. They're ready when they start to look a little too cozy on the baking sheets. By this time, you'll notice the lighting has changed considerably. We're into dusk. The whole process takes hours but it didn't seem like it. We were too busy making soup, cleaning up and just chatting. It was ideal for a wintry day. The final step: bake for 18 minutes - turning the cookie sheet around at the halfway point to ensure even browning. Now the best part: Take a just-out-of-the-oven bun, tear it in half and smear a thick layer of butter all over it. Eat. Enjoy. Repeat. I don't much enjoy the arduous task of squatting amid a mosquito-infested patch of blueberry bushes, fidgeting around in their leaves and gently plucking what little gems I find. I don't enjoy the bending, the strange cobweb-coated discoveries in the leaves or the dry twigs scraping tiny gashes across my thighs. To be honest, I don't even enjoy tasting a few juicy berries during the ordeal. But the bucketful of blueberries after all of it, that is definitely worth it. Worth it only because of the blueberry crepes I know I'm going to be devouring at breakfast the next morning. The process is long. Not only do we spend several hours picking the berries and several hours sorting them, the crepe making is no simple task. These crepes are no ordinary pancakes. They are blueberry-stuffed crepe pockets topped with fresh whipping cream and cooked on a wooden stove by my grandmother. And I only get them this good when I visit the cottage, about once a year if I'm lucky. On those lucky mornings, my grandmother, or Oma as I call her, wakes up before anyone else to start the fire and whip together the ingredients. Since we don't have electricity, except when we briefly turn on the generator, she mixes the eggs, milk and flour together with a hand beater. Then she starts ladling the mixture into a cast-iron pan, swirling it around as thin as possible. She only cooks one side before tossing the crepe onto a buttered plate, raw side down, and scoops two or three spoonfuls of heated blueberries close to the bottom of the crepe. Then she folds the bottom over the berries. And then folds both sides over like so. Then rolls it over to form a square. I sprinkle mine with white sugar and top it with fresh whipped cream. And then I eat until my blueberry bloated tummy can't take it anymore. Make a well in the flour and add salt, unbeaten eggs and one cup of milk. (Substitute some of the milk with cream for added decadence.) Beat with mixer or by hand until free from lumps. Add rest of milk and continue beating to make very thin batter. Cook in cast iron skillet brushed with butter. Pour in a ladle of the mix and tilt pan until entire bottom is coated. Cook until edges start to curl up and the bottom is brown. Flip raw side onto buttered plate and spoon on filling as described above. Often, I find myself insisting friends come over for dinner. I enjoy cooking for them, whether it be a hasty concoction from whatever is left in my fridge or a blog recipe that I've been drooling over. But the best part is having company since so often my meals are scarfed down in front of a computer monitor or eaten on my couch with my plate perched on my lap. So it is a special treat to not only have a guest but have them cook for me as well. And especially to wake up to a chocolate chip pancake extravaganza after lazily sleeping in until noon. But this time he pimped it up with a slathering of whip cream topped with raspberries and slices of mango. And in a last second Emeril Lagasse "kick it up a notch" style inspiration, he sprinkled it all in cocoa. And when we'd eaten more than we thought we could eat, he nudged me and said, "Hey, maybe this can be a guest blog." "Maybe," I replied, none too surely. But here it is. 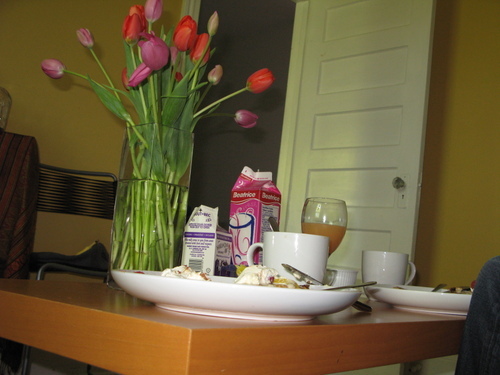 Maybe not so much a blog by a guest, but a blog entry about great guests. This spring tantalized and teased us with an early wave of hot weather. Like many I swapped my winter clothes for summer ones and started eyeing up the fresh produce section of my grocery store for the first edible signs of spring. But in the past few days, I've been reaching into my closet for gloves and digging deep into my cupboards for comfort food. 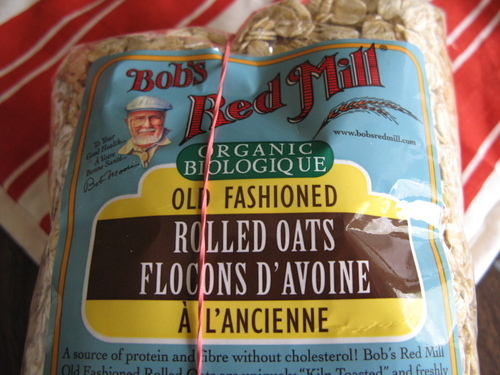 And so as rain dripped drearily in the dog park outside my window, I pulled out the traditional winter staple: oatmeal. I always used to toss whatever instant oatmeal was on hand into a pot and boil it to death with the requisite amount of water. But during one of my many nights flipping through cookbooks, I noticed a recipe for oatmeal in Mark Bittman's How to Cook Everything. The recipe is quite simple and there's nothing all that remarkable about it (though the addition of butter did give me pause). But what the recipe did was make me think about the fact that oatmeal doesn't have to be the nasty gruel you grew up with. Like almost anything, it can take on a little gourmet flair. 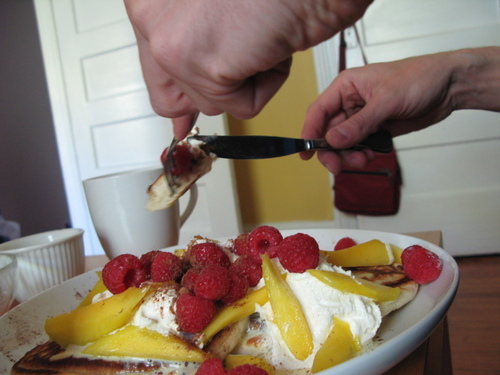 To that I end I drizzled mine with wildflower honey, poured on thick organic cream, then tossed in some raspberries. And I have to admit that while savouring that steaming bowl of oatmeal, it didn't seem so bad that spring is taking its sweet time. 1. Combine the water, salt and oats in a small pot. Turn heat to high, then turn down to low when the water boils. Cook, stirring, until water is just absorbed, about five minutes. Add butter. Turn off heat. 2. About five minutes later, uncover pan. 3. 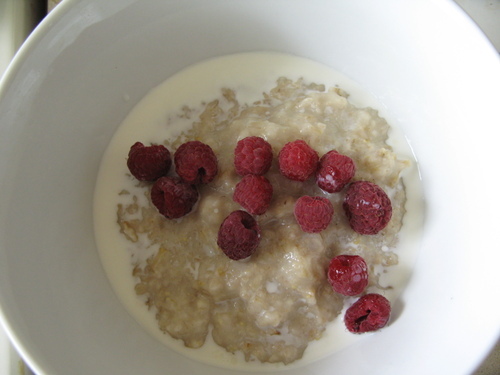 Put oatmeal in bowl, stir in sweeters such as brown sugar, maple syrup or honey and cream or milk. One lone biscuit and a few crumbs. That was all that was left to photograph minutes after an impromptu Sunday breakfast that saw the lowly biscuit paired with the highfalutin' oeufs en cocotte. 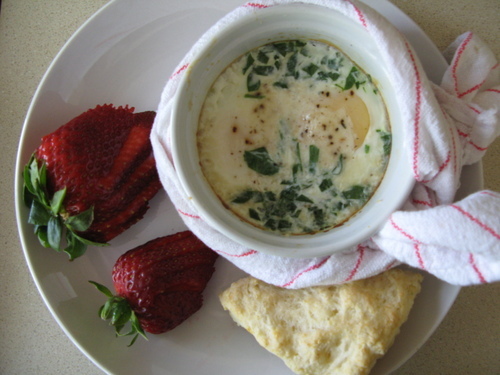 I first came across mention of oeufs en cocotte, also known as shirred or baked eggs, when reading Julie and Julia. The book is based on a blog Julie Powell wrote about her successful attempt to make all 524 recipes in Julia Child's Mastering the Art of French Cooking in the course of a year. While Powell's tales of butchering lobsters alive and boiling hooves to make aspic seemed a bit too extreme for my tastes, oeufs en cocotte - despite the grandiose name - seemed do-able. And the biscuits, well, my grandmother seemed to make them at the cottage for her lazier morning feasts. In the end, both were fairly easy. The biscuits came together in the time it would have taken me to walk somewhere to pick up bread. And the eggs were prepped in no time. Then it was just a matter of waiting for both to finish baking. This is really just a fancy name for baking eggs in a buttered ramekin. Preheat oven to 375 F. Butter the ramekins (no margarine!). Pour enough cream to cover the bottom in a thin layer. Break an egg into the ramekin, or two if you're using a larger one. Sprinkle parmesan and parsley on top. Bread crumbs are also nice. Place the ramekins on a baking sheet, then bake for about 10-15 minutes or until they are set. When in search of a simple, hardy recipe for biscuits, I knew I had to go to the main source from the homeland: The Mennonite Treasury of Recipes. In its flour-caked and butter-splattered pages, I found a recipe that would do my grandmother's biscuits justice. The recipe below makes about 12 biscuits. Dump in all the milk at once. Stir quickly until it forms a soft dough. It will be a little sticky, but not too much. Knead for half a minute on a lightly floured surface until it's not sticky. Pat into a disc until it's half an inch thick. 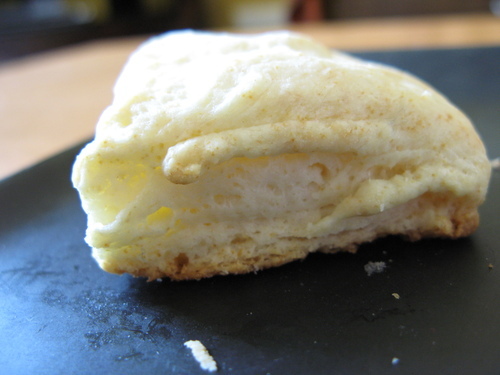 You could use a proper biscuit cutter or just use a knife to slice the dough into squares. Place on an ungreased sheet and bake in 375 F oven for 12-15 minutes, or until lightly brown. NOTE: You can add a tablespoon or so of sugar into the flour mixture if you want to sweeten the recipe. Before taking a cooking course this spring at George Brown College, I had never eaten eggs benedict. As an 'eggs over hard' kind of gal it never occurred to me that I might enjoy a runny egg drowning in a yolky sauce. But I did. And since then I've made a number of times. By no means am I an expert but I figure since it's worked out each time, I'm doing something right. As my class chef Gary said, "It either works or it doesn't." He also noted that you'd be hard-pressed these days to find a restaurant that still makes their own hollandaise sauce. The majority use packages since the sauce is so time-consuming and then keeps for only 45 minutes. So it's worth it to make this treat at home. It may be the only time you get the real homemade stuff. 2 toasted and buttered English muffins. 4 slices of peameal bacon or ham. 1. Put a large pot of water on the stove on high heat to bring it to a boil. 2. Meanwhile, in a small saucepan, toss in the first five ingredients: bay leaf, shallots, white vinegar, water and peppercorns. Bring it to a boil until it is reduced by half. Since it's already a small amount, watch it closely. Take off element. Add 1 Tbsp. water and allow to cool. 3. In a large bowl, start whisking your egg yolks. Hold bowl over pot of boiling water while whisking. The bowl should be held over, but should not touch the water. Whisk, whisk, whisk until you think you can't whisk anymore. (For me it's about 5-7 minutes before I feel like my arms might fall off.) You're done whisking when your eggs are like soft whip cream and reach the so-called ribbon stage -- when you drizzle the eggs and they look like a ribbon piling up. 4. Put the vinegar-shallot reduction through a sieve, then drizzle it ever so slowly into the eggs as you whisk like mad. 5. Next up is all that melted butter. Add a little bit of it at a time, always whisking. Don't get carried away and dump the hot butter in because it might cook your eggs. 6. Then, the final step is to add your seasoning -- the lemon juice, salt, pepper and a drop or two of Tabasco (this amount won't make it spicy, but will round out the flavour). Taste your concoction and add more of any of these as you deem necessary. Now that your wrists are shaking and you don't think you can take anymore, get to the easy parts of this morning feast: toast the English muffins, cook the peameal in a pan and poach the eggs. There's an easy way to poach eggs. You don't need any special devices. Just bring a big pot of water to a boil (I usually use the one I already had on for the hollandaise sauce). Pour a few glugs of vinegar into the pot. Reduce to a simmer (there should only be a little movement in the water). Take a big spoon and swirl the water around. Crack open the eggs and toss them in. Let them cook about three minutes. Using a slotted spoon, remove them and then blot dry a bit with a paper towel. 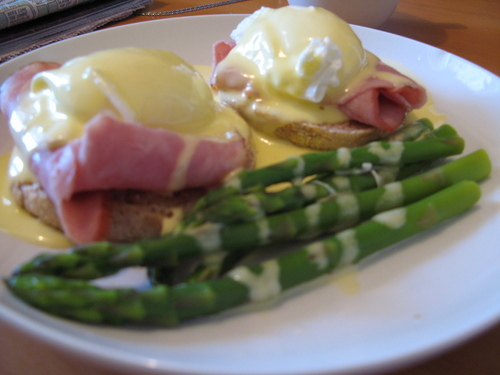 Put on top of your English muffin and peameal bacon, then coat it all in your fabulous hollandaise sauce and voila! A masterpiece worthy of the finest restaurants.